Organic reach on social media is getting harder. Content is being seen, shared, and engaged with less and less with each Facebook algorithm change. Whether you have a large or small following, your audience may not be seeing your content in their feeds. Consider using Facebook advertising to improve your reach and increase sales. Even $25 for a “boosted” post can make a difference, especially if you use the tools to target the demographics of your specific audience. Boosted content will appear in the newsfeeds of those who haven’t liked your page yet, helping you to gain both fans and ticket sales! In addition, running a social media advertising campaign is very cost-effective, as you can choose a daily budget or a set amount for the life of the ad, and the platform will charge you per click. Compared to traditional advertising, the overall cost is much more manageable for large and small non-profits. Ads can be run on Facebook, Instagram, Twitter, LinkedIn, YouTube and Pinterest. This guide will mostly be addressing the use of Facebook and Instagram ads. Within your Facebook business account, click on ads manager, then under create & manage, select ads manager. This should help navigate through your ads manager account. As you promote your raffle, you will mostly be aiming to increase awareness of your organization and raffle, lead traffic to your raffle page, and convert your audience into ticket purchasers. Facebook allows you to customize your target audience based on their interest, demographics, location, actions on your website and much more. With your raffle, you can target persons who have been to your website, clicked on the raffle page, or like your organization on Facebook. For your budget, you are able to set your spending amount and schedule the ad to run within a certain time frame. 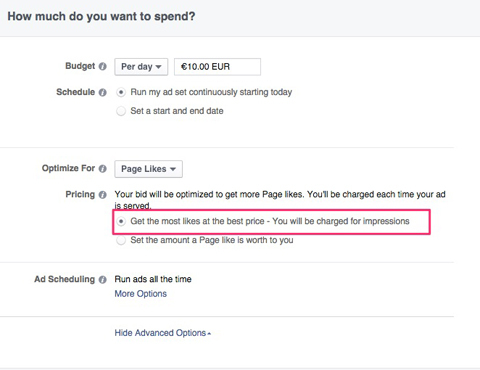 You also have the option to 'optimize' based on likes, clicks, and impressions to produce your desired result. Your schedule can outline the timeframe you wish your ad to run, as well as the times you want it to run. This can be useful to turn ads off at times when online traffic is low. Your content will be directed towards the fundraising cause or the prize. Consider running an ad focusing on each. More than 80% of social media users are accessing the platforms from their phones or tablets, so be sure the ads are compatible and compelling on these devices. You have the option to upload an image or re-use an image you have already posted to your page. To create beautiful ad designs, ensure you are using colourful, high-quality, and eye-catching images. Be sure to place your main value proposition in the ad image, so that people will read it right away as they see your ad. Keep in mind you will only be allowed to have 20% of your ad be text and 80% must be the image. Use the right image size (1200 x 628) so your ad looks good and fits every screen. Remember, keep your ad copy short and extremely clear. Here, the goal isn’t selling. It’s about convincing users to click on the ad to discover more. Try to be catchy and explain to users why they should click. Offering discounts and freebies usually helps. However, be careful not to attract too many cheap clicks that won’t convert. You are also given the choice of where you'd like your ad to appear. You can choose from the news feed, mobile, right column, Instagram, audience network, and in-stream videos. It is best to test out various ad types to see what is best for your raffle and organization. You will be able to make your call to action in the Headline, News Feed link description, and the call to action button. For a raffle, you would most likely use the 'shop now' button option to encourage persons to 'shop' for raffle tickets. When running a raffle, your landing page will most likely be your raffle page. If that is where you are directing your traffic, be sure that it is complete with a banner image, text box colours, information about your organization, and what you are fundraising for. Try to use visuals in your ad that are similar to what persons will find on the raffle page, that way there will be continuity between the two. There are a number of moving parts when putting together an ad, so it is important to re-read and check every aspect of the ad before throwing money behind it. Split testing allows you to compare different text, images, slogans, headlines, and calls to actions. Run both or multiple ads and see which is performing best. At that point, remove the others and continue running the most effective ad.